Since we’ve covered the basics of pot-odds we now need to further our knowledge with a really important concept known as “implied odds”. This is additional factor we take into account when making calls which is based on actions in later streets. Implied Odds are the pot odds to take into consideration in later streets i.e. how much money you can win from the pot after you make your draw. 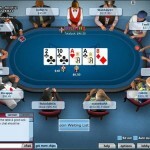 Unlike pot odds where a player has the current mathematical information required to work out the odds and profitability, the implied odds are unknown. This is because the money in the pot hasn’t been put there yet so we can only “estimate” how much the pot will be worth. For example, if there is $200 in the pot and it requires $20 to call, you’re receiving 10:1 for your pot odds. What you also need to take into account however is that if you hit your flush or draw on the turn or river, will you be able to increase the size of the pot with table action and make the future pot odds even greater? The answer to this in many cases is yes and that’s why implied odds are a fundamental part in the decision making process. Calculating expected value and pot odds is really only half the story when making a decision to call or enter a pot with a draw. Importantly, the advantages of implied odds are much greater against loose-aggressive opponents or calling stations, because these are the type of players who will call you off better when you hit your draw. Situation: You’re holding a small or medium sized pocket pair in No Limit Holdem. Your odds of hitting a set (in essence winning the hand) on the flop is 7.5:1. (about 1/8 times). Pot odds theory will say you need to have at least 7 other limpers to see the flop to make the hand profitable. The whole point of implied odds however is that if you hit your set, it doesn’t mean the action at the table will stop (as is assumed in pot odds). In fact, if you hit your set the majority of players at the table will be unaware of it and will probably keep putting money in. When you hit your set you might end up getting 20:1 or more for your money from other players calling light – especially if they’re deep-stacked. The point here is that you can still play hands with the wrong pots odds, so long as the implied odds cover the negative equity. Let’s say rather than 7 limpers in the above example you only get 4. This means you’re only getting 4:1 for your pot odds which is lower than your hand odds. However if we then say that all four players will continue to call your bet on the turn and river after you hit your set, then the calculated pot odds are actually more like 12:1 (considering all bet sizes are the same throughout the hand). This is because you have 4 callers preflop, 4 callers for the turn and 4 callers for the river. Obviously the biggest problem estimating implied odds is that they’re based on hypothetical scenarios and largely depend on the strength of your opponents’ hand and how likely they are to call you once you complete your draw. It is very difficult to accurately calculate implied odds because of this and badly interpreting your opponents’ image may mean your exagerate your realistic implie odds, and end up making unprofitable calls.